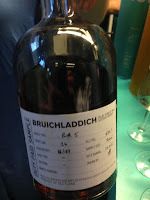 The Bruichladdich stand was really good at the show. Like really, really good. You've got something like 800 whiskies in the building, a tonne of brands and distilleries. It takes something special to keep pulling you back to one in particular. The whiskies were incredibly impressive. The lady on the stand was really nice and it was great to chat while tasting some of these. I have to say I’m really impressed with Adam Hannett, he had big shoes to fill and he is doing it in style. Maybe more white wine casks in the mix than before but I love it. Nose: Meaty red fruit, a lot more wine influence than I remember, some light citrus, toffee, fudge. Taste: Fresh at first, then meaty red fruit, intense mineral/stony notes, wine-y. Finish: Medium length. Mineral, oaky, unbalanced. Last time I tasted this it was all young citrus, light toffee and fudge. They’ve really dialled up the wine cask influence these days. Nose: Dark, rich and complex. Really quite decadent with fig, clove, red berry, earthy, plum and red grape. Taste: Lovely. Very fruity, red berry, blackberry, blackcurrant, complex spice, more oak then builds. Finish: Long length. Plum and red grape fruitiness. Pre-release sample. I found this much better balanced than the 4.1, which I found a little thin a times with a short finish. This however, is great. Nose: Lovely Sherry/Bourbon sweetness, red berry, cinnamon cake, white grape, musty sweetness. Not much smoke to be found here but the musty white grape notes are lovely. Taste: Lovely, peat/sweetness combo, great balance, great power, red berry and desert wine sweetness. Finish: Long length. More peaty now with white wine. I am just starting to get into my wines, which helps. This has a great level of everything, balance, complexity, sweetness, peatyness. Really has been expertly blended. 60% Bourbon, 20% Sherry, 10% French Red Wine, 10% Fortified French White Wine. A must buy! 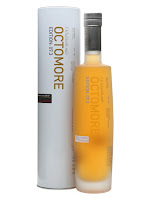 Nose: A mineral Octomore, meaty peat with elegant sweetness. Taste: Soft and light (Yes, I know. An Octomore, Light?!). White wine sweetness, then peat and berry notes build up, red grapes, mineral and phenolic. Finish: Long length. Red grape, meaty with peat. 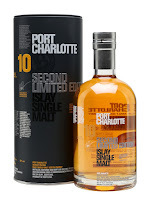 I was expecting more from this after the 2005 Octomore I had at Bruichladdich. 50% Bourbon, 50% White Wine casks. 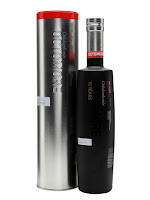 Let’s try another Octomore to test it against. Nose: Rubbery, meaty peat, white wine sweetness, musty white grape. Great balance and power here. Taste: Bam! White grape, musty, meaty red berry, wow, mineral peat, great. Water brings out an interesting impossibility- Heavy and yet light. Finish: Long! length. Great balance and sweetness continues. Better without the water actually and really blows the new 10 year old away. 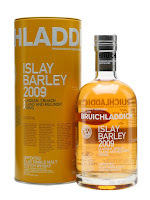 Islay barley, finished in Moscatel wine casks. How do they make this good whisky at 5 years old?! Some very high scores here for the Laddie, the PC I was tempted to go higher but these are fantastic. The PC is the buy for me as I think the Oct and Black Art will be twice the price.